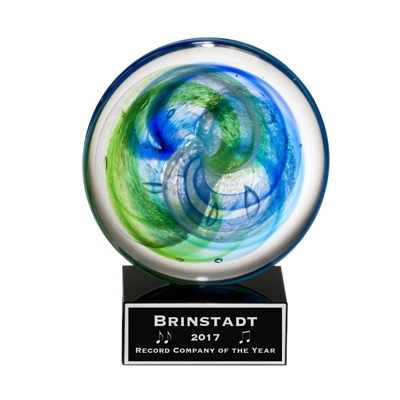 Beautiful blue and light green swirls of color embellish the center of this one-of-a-kind art glass award. Each piece of art glass is individually hand blown, so air bubbles and color variations are common. Your custom text and logo/graphic can be laser-engraved into a black & silver plate placed on the base of the award. Each glass award is individually gift boxed.